It was the last lab of my American Baking & Pastry class so naturally I wanted to finish on an up note. For the most part I've been doing well with the baking, with some glitches here and there, but nothing that would make me feel like a baking dummy. 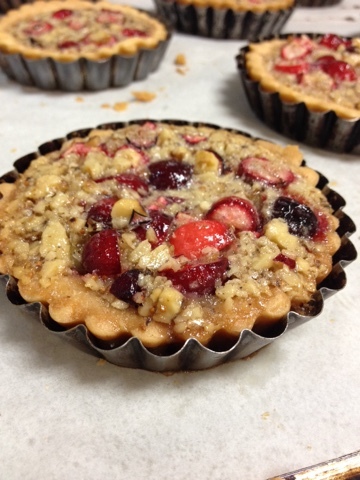 But along came the Cranberry Walnut Tart. And that dough. That dough! Let's start from the beginning. I decided this morning that I wanted to do the special dessert for this week. The week's theme was New England and what's more New England than cranberries? Looked over the recipe, seemed simple enough. Thought it was strange we using a different dough for the tart shells, especially since there was an Apple Caramel Tart for the B menu that used Pate Brisee. Whatever, a new dough to learn. The trick with this dough, according to Chef, was to keep it cold. Frozen. So we tried to work quickly, rolling out the dough in the sheeter and cutting out pieces to fit into the tart tins without really having to work it too much. Mostly pushing it into the tin, removing any air bubbles, and cutting off the excess. When we had our 24 tart shells, we stuck them in the freezer and waited. Every now and then I would peek and press on the dough, to feel for any give. When it seemed firm enough, I pulled the tray out of the freezer and popped them into the convection oven. The recipe calls for it to bake in a convection over until pale before pulling them out, filling, and finishing the bake in a deck oven. All was well for a minute. Then came the fall. I really did say that. All exaggerated with clenched fists and shaking my head. Why did they collapse?!? We just couldn't figure out what happened. Followed everything according to the directions. Except one. 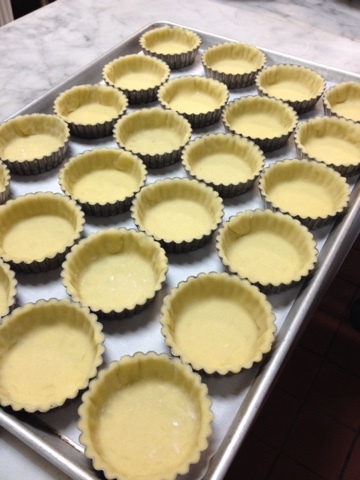 We didn't show Chef the tarts before they went in the oven. When we called him over, it was what he pointed out first. What we thought was frozen wasn't frozen enough. They should have gone into the rapid chiller before baking. There was some leftover dough, but I went ahead and made another batch. I was planning on making some anyways. Wrapped the finished dough in cling and let it sit in the freezer while we rolled out the old dough. 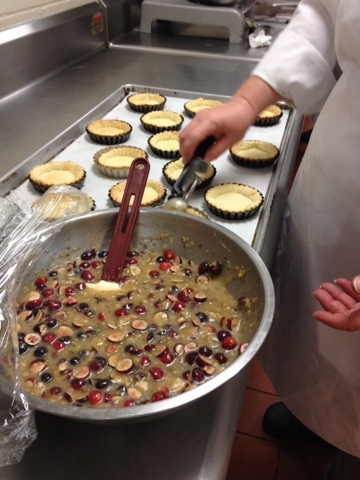 When the tarts tins were prepared, we placed them in the rapid chiller and let them sit there for about 30 minutes. Chef cranked up the temperature in the convection oven slightly, and stayed there to watch how the frozen tart dough would fare. First minute was okay. Whew. "We've been having problems with this all week." Really? If only this was mention when we started! I felt slightly better. 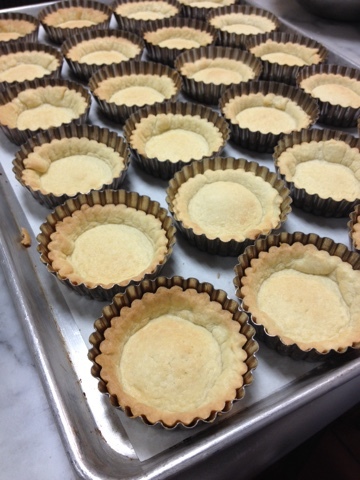 It wasn't as tall as it was supposed to be, but we still used the baked tarts. 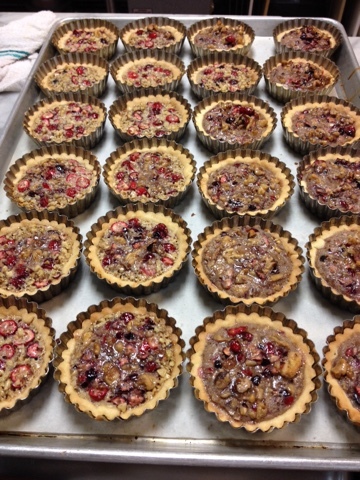 The filling for these tarts is similar to pecan pie filling. Walnuts are toasted in a pan before being chopped. My partner was in charge of the walnuts and chopped them fine, but not too fine. 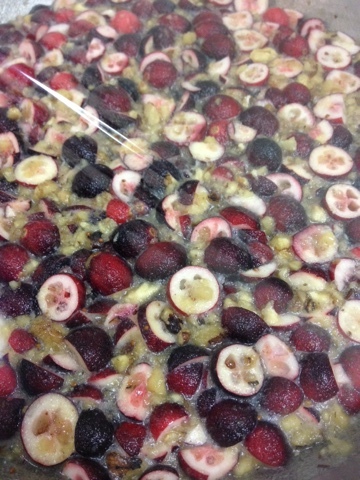 I roughly chopped the cranberries, you should be able to tell that there are cranberries in there. To this eggs, melted butter, brown sugar, and corn syrup are added. 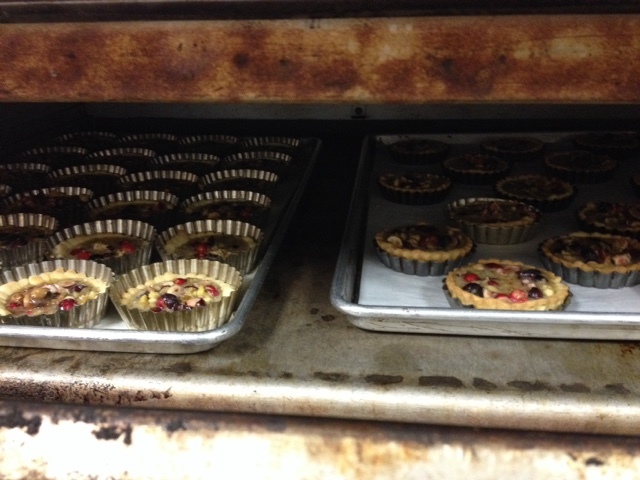 Filled the tarts and baked them in a deck oven at 350. As you can see, a decent portion of the walnut/cranberry with just enough of the liquid from that mixture. According to the recipe, it should be baked for 10-15 minutes of until firm. Ended up taking 20ish mintues and turning the pans around. How it looked like finished. Kind of surprised it didn't brown too much. Here's some close up action of the tart. I suppose I could have chopped the cranberries finer, but wouldn't you want to be able to tell you were in fact eating a cranberry? Got to eat a broken one. Reminded me of the walnut boat tarts I used to buy from the Philippine Bread House.